Kwantlen Polytechnic University’s (KPU) Faculty of Community and Health Studies has been renamed the Faculty of Health, a change effective as of April 1. The new name coincides with the faculty’s only non-health-focused program – the Special Education Teaching Assistant program – moving to the Faculty of Arts. Read more…. 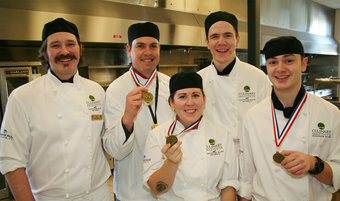 Vancouver Island University Culinary Arts students have done it again! They won several medals, including grand gold, grand silver and grand bronze, at the 16th annual BC Chefs Hot Competition Live at the Vancouver convention centre as part of the BC Foodservice Expo. The two-day cooking extravaganza included competitors from all levels of cooking in professional, team, apprentice, post-secondary and high school categories. Read more…….